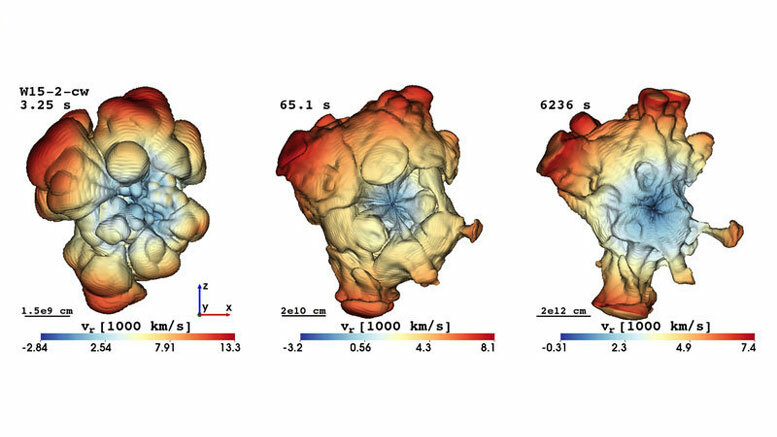 Using elaborate computer simulations, researchers show how radioactive elements in gaseous supernova remnant Cassiopeia A can provide glimpses into the explosion of massive stars. Stars exploding as supernovae are the main sources of heavy chemical elements in the Universe. In these star explosions, radioactive atomic nuclei are synthesized in the hot, innermost regions during the explosion and can thus provide insights into the unobservable physical processes that initiate the blast. 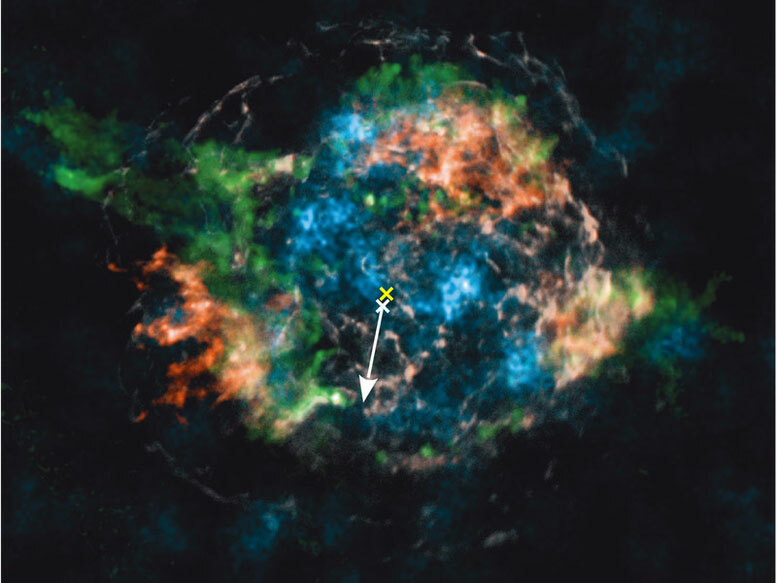 Using elaborate computer simulations, a team of researchers from the Max Planck Institute for Astrophysics (MPA) and the research institute RIKEN in Japan were able to explain the recently measured spatial distributions of radioactive titanium and nickel in Cassiopeia A, a roughly 340 year old gaseous remnant of a nearby supernova. The computer models yield strong support for the theoretical idea that such stellar death events can be initiated and powered by neutrinos escaping from the neutron star left behind at the origin of the explosion. The physical processes that trigger and drive the explosion have been an unsolved puzzle for more than 50 years. One of the theoretical mechanisms proposed invokes the neutrinos, because they carry away more than hundred times the energy needed for a typical supernova. Leaking out from the hot interior of the neutron star, a small fraction of the neutrinos are absorbed in the surrounding gas. This heating causes violent motions of the gas, similar to those in a pot of boiling water on a stove. When the bubbling of the gas becomes sufficiently powerful, the supernova explosion sets in as if the lid of the pot were blown off. The outer layers of the dying star are expelled into circumstellar space, and with them all the chemical elements that the star has assembled by nuclear burning during its life. But also new elements are created in the hot ejecta of the explosion, among them radioactive species such as 44Ti (titanium with 22 protons and 22 neutrons in its atomic nuclei) and 56Ni (28/28 neutrons/protons), which decay to stable calcium and iron, respectively. The thus released radioactive energy makes a supernova shine bright for years. Because of the wild boiling of the neutrino-heated gas, the blast wave starts out non-spherically and imprints a large-scale asymmetry on the ejected stellar matter and the supernova as a whole (Fig. 1), in agreement with the observation of clumpiness and asymmetries in many supernovae and their gaseous remnants. The initial asymmetry of the explosion has two immediate consequences. On the one hand, the neutron star receives a recoil momentum opposite to the direction of the stronger explosion, where the supernova gas is expelled with more violence. This effect is similar to the kick a rowing boat receives when a passenger jumps off. On the other hand, the production of heavy elements from silicon to iron, in particular also of 44Ti and 56Ni, is more efficient in directions where the explosion is stronger and where more matter is heated to high temperatures. “We have predicted both effects some years ago by our three-dimensional (3D) simulations of neutrino-driven supernova explosions”, says Annop Wongwathanarat, researcher at RIKEN and lead author of the corresponding publication of 2013, at which time he worked at MPA in collaboration with his co-authors H.-Thomas Janka and Ewald Müller. “The asymmetry of the radioactive ejecta is more pronounced the larger the neutron star kick is”, he adds. Since the radioactive atomic nuclei are synthesized in the innermost regions of the supernova, in the very close vicinity of the neutron star, their spatial distribution reflects explosion asymmetries most directly. Since the neutron star propagates with an estimated speed of at least 350 kilometers per second, the asymmetry in the spatial distribution of the radioactive elements is expected to be very pronounced. Exactly this is seen in the observations (Fig. 2, left panel). While the compact remnant speeds toward the lower hemisphere, the biggest and brightest clumps with most of the 44Ti are found in the upper half of the gas remnant. The computer simulation, viewed from a suitably chosen direction, exhibits a striking similarity to the observational image (Fig. 2, right panel). But not only the spatial distributions of titanium and iron resemble those in Cas A (for a 3D visualization, see Fig. 3 in comparison with the 3D imaging of Cas A available at the weblink http://3d.si.edu/explorer?modelid=45). Also the total amounts of these elements, their expansion velocities, and the velocity of the neutron star are in amazing agreement with those of Cas A. 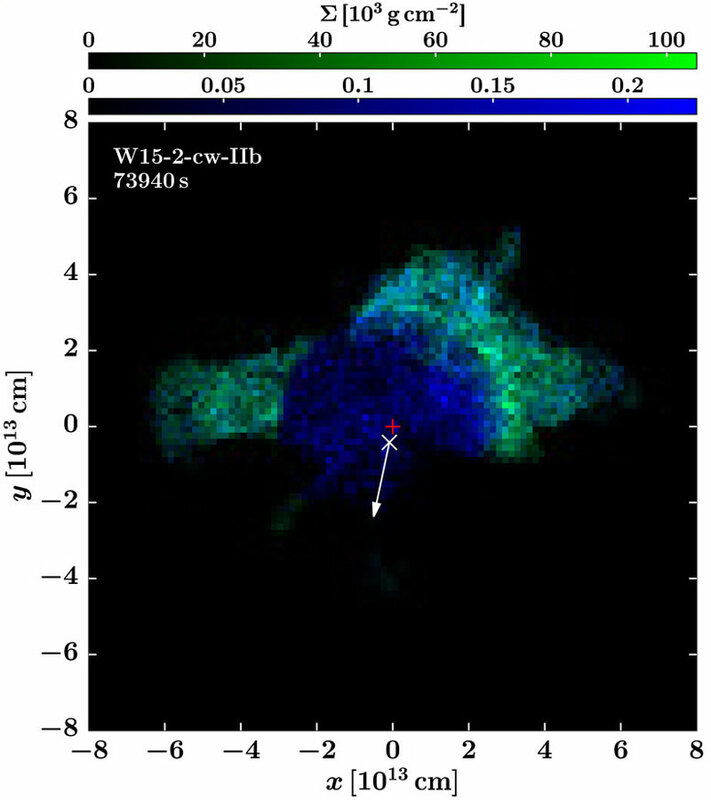 “This ability to reproduce basic properties of the observations impressively confirms that Cas A may be the remnant of a neutrino-driven supernova with its violent gas motions around the nascent neutron star”, concludes H.-Thomas Janka. But more work is needed to finally prove that the explosions of massive stars are powered by energy input from neutrinos. “Cas A is an object of so much interest and importance that we must also understand the spatial distributions of other chemical species such as silicon, argon, neon, and oxygen”, remarks Ewald Müller, pointing to the beautiful multi-component morphology of Cas A revealed by 3D imaging (see http://3d.si.edu/explorer?modelid=45). One example is also not enough for making a fully convincing case. Therefore the team has joined a bigger collaboration to test the theoretical predictions for neutrino-driven explosions by a close analysis of a larger sample of young supernova remnants. Step by step the researchers thus hope to collect evidence that is able to settle the long-standing problem of the supernova mechanism. Be the first to comment on "Radioactive Elements in Cas A Provide Glimpses into the Explosion of Massive Stars"